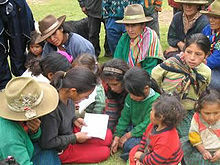 Quechuas is the term used for several ethnic groups in¨South America that use a Quechua language (Southern Quechua mainly). They belong to several ethnic groups in South America, above all in Peru, Bolivia and Argentina. The Quechuas of Ecuador call themselves - as well as their language Kichwa - Kichwas or Quichuas. The Kichwa-speaking group of Colombia are the Ingas. This page was last changed on 14 August 2018, at 04:22.